The group that built the first mosque in Gloucester and assists with the quick burials for Muslims was awarded the Queen’s Award for Voluntary Service, the highest award a voluntary group can receive in the UK. 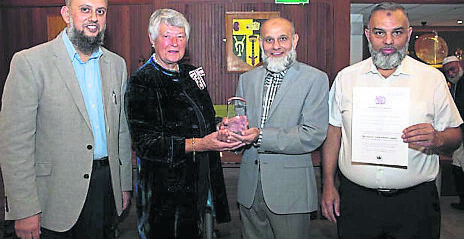 Gloucester Muslim Welfare Association (GMWA) was awarded for five decades of community work, including building the first mosque (Masjid e Noor Spiritual Light) in Gloucester South West and Wales in 1983. GMWA was formally presented with the Award by Her Majesty’s Lord Lieutenant of Gloucestershire, Dame Janet Trotter on September 27 at the Civic Suite Council Chamber, North Warehouse. GMWA also joined the Helping the Hospital League of Friends, with equipment needs for Gloucester Royal Hospital. The Association is one of 193 charities to receive the prestigious award this year. In a statement to The Muslim News GMWA President, Yakub Patel, spoke of his delight at the recognition. “Thoroughly deserved by the many devoted and hardworking members of the Association who give an incredible amount of time and energy to enable the extensive work in the Community,” he said. The Association provides a unique service to the community taking full responsibilities of ensuring that the burial can take place as quickly as possible and that all legal formalities are taken care of.